So we all know that chocolate and mint make a fine pair in desserts and sweets. I find dark and bittersweet chocolate work best with mint since they balance each other's tart and sweet characteristics. Taking a classic brownie recipe from Cook's Illustrated, I added bittersweet chocolate chips to the batter before baking. After it baked, I topped it with a chocolate ganache before garnishing with more bittersweet chocolate and mint chips. If you need a chocolate fix with a bit of mint, this brownie recipe will hit the spot! If you can't find mint baking chips, add 1 teaspoon of peppermint extract + 1 tablespoon creme de menthe to your chocolate ganache. Preheat your oven to 325. Grease a 9x13 baking dish and set aside. In a medium bowl, whisk together the flour, salt and baking powder; set aside. In a large, microwave safe bowl, melt chocolate and butter on high for 45 seconds, then stir and heat for 30 seconds more. Stir again, and, if necessary, repeat in 15-second increments; don't let chocolate burn. When the chocolate is completely smooth, gradually whisk in the sugar. Add the eggs one at a time, whisking after each addition until thoroughly combined. Add the vanilla and then carefully fold in the flour mixture in three additions, folding with a rubber spatula until the batter is completely smooth and homogeneous. Add 1/2 of the bittersweet chocolate chips to the batter and stir just to combine. Transfer the batter to the prepared baking dish and spread the batter to evenly fill the pan. Bake in the preheated oven for about 30-35 minutes or until a toothpick or wooden skewer inserted into the center of the brownies comes out with a few moist crumbs attached. *Don't over bake! * Remove from oven and allow to cool on a wire rack. While brownies are still warm, spread the prepared ganache over the top of the brownies and then sprinkle with the remaining bittersweet chocolate chips and mint chips. Allow to cool to room temperature, which will also allow the chocolate ganache to set up. Cut the brownies into 2 inch squares and serve. Good golly they look so rich and delicious! My hubby loves chocolate mint so he would devour these in an instant. These look delicious! I love the combination of chocolate and mint (one of my faves). These look absolutely heavenly! I love mint with chocolate! Triple Chocolate & Mint Brownies is the best ever. 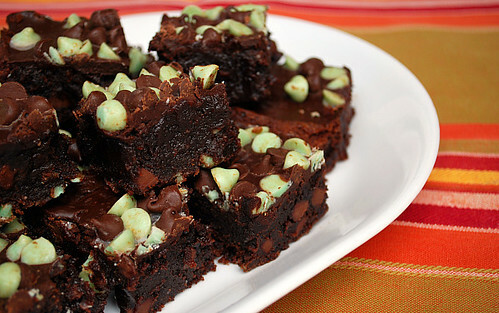 I am getting so hungry in looking at the picture of this Triple Chocolate & Mint Brownies. I want to try it badly.